Indeed, it did not. 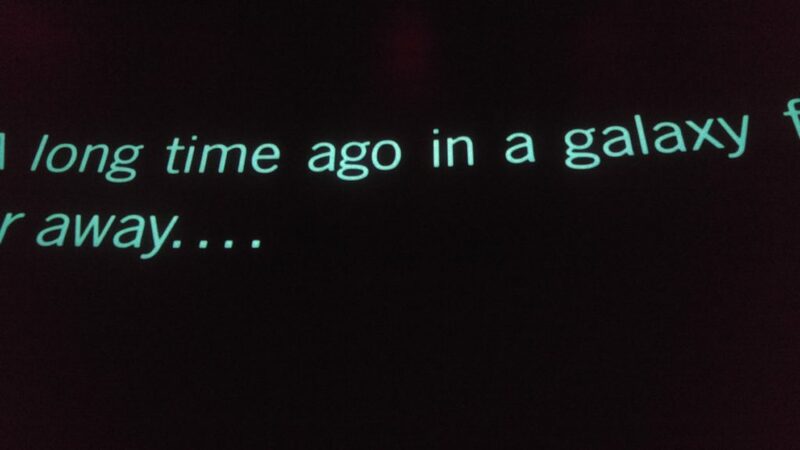 The opening crawl set an immediate expectation that the movie would start exactly like Empire, in a parallel Hoth evacuation. I literally had a bad feeling about this. And then the movie surprised me. And it kept on surprising me, by setting up expectations again and again, and then deliberately breaking them. The opening scene – we thought it would be a Hoth evacuation, but instead it was a space battle. Rey on Ach-To – even her “training” was more of a discourse by Luke about how wrong she was about everything. Including her 3rd and final “training” which was their throw-down. The entire escapade to find the code breaker – ending in total failure and capture, and Leia taking down Poe. The Throne Room scene – everything about it. In the end, no one turned from dark to light or vice versa. And yet, enemies were allied, and allies were enemies. Snoke, and Rey’s parents, such elements of speculation from Episode VII, now revealed as nothing more than red herrings. The betrayal of Finn and Rose. It echoed Han’s mercenary streak, but there was no redemption. It was just business. The closing scene gave us the desperate Hoth last stand (minus the evacuation), but ended on a far grimmer note. Hoth was a success, whereas Crait (note, not Krayt, as I had assumed) was an utter failure. I’m not complaining about the above, now that I finished the movie. I admit though that at every point, I was cringing from the expectation of a heavy-handed callback to an earlier film, and then relieved it didn’t happen. This means that the second viewing will probably be a lot more enjoyable than the first, which actually is always true, but this time for a different reason. On second viewing, The Last Jedi will be its own film. there were utterly sublime moments. Rey in the cave – what was that? I don’t know, but it was amazing, and for once gave a truly mystical aspect to the Force, in a place that Luke characterized as “darkness” but turned out to be infinite reflections. Reflections aren’t a feature of darkness. Then, the utter silence of the breaking of the Mega Star Destroyer in two. What a beautiful, absolutely mesmerizing moment – perfectly rendered in stillness. The way silence was also used for the connection between Rey and Kylo was perfection. And finally, Luke’s final trick, which literally consumed him. Seeing it again on Sunday. I can’t wait. UPDATE: remembered a couple other touches that were notable: Rey saved the Jedi Order books, which makes Yoda’s badass calling down the lightning somewhat mischievous. Just tell Luke the books are gone, you old peanut! The Force-sensitive boy at the end, casually pulling his broomsaber to him -for some reason, in tone, evoked Luke looking at the two suns (though we got a nice callback to that scene, in homage, for Luke’s final scene, too). And finally, it’s clear that Poe is being groomed for leadership of the resistance, much as Rey seems being groomed to relaunch the Jedi order, just as Kylo ascended to leadership of the First Order. This movie was all about passing the baton. And yet, Star Wars was always about the Skywalker clan. The next movie won’t have any. Where does Episode 9 go from here? Aziz, I need to take lessons on Star Wars mythology. I love Star Wars but you take it to a different level. I like the point about the use of silence, not just for the dreadnought, but for the connection – that inverted sound cut off was a really excellent cue, and it was timed perfectly with the change in Rey and Kylo’s expressions.